Coach John Harbaugh said Dixon (knee) is a candidate to be activated from injured reserve later this season, Ryan Mink of the Ravens' official site reports. Analysis: In the midst of a 44-yard, one touchdown effort Week 1, Dixon limped off the field and diagnosed with a knee injury of unknown severity. Within days, he was placed on IR, meaning he must miss at least eight weeks. Considering the Ravens have a Week 10 bye, Dixon's first chance to return to the field will be Nov. 18 against the Bengals. The Ravens placed Dixon (knee) on injured reserve Tuesday, Jeff Zrebiec of The Athletic reports. Dixon, who sustained a knee injury in Sunday's 47-3 win over the Bills, is expected to be sidelined for several weeks, a source informed Ian Rapoport of NFL Network. 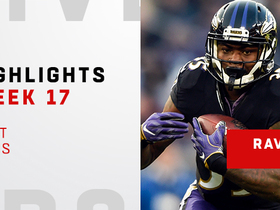 Dixon (knee) didn't participate Tuesday in the Ravens' walk-through session, Jamison Hensley of ESPN.com reports. Analysis: Dixon was also a spectator Monday. With the Ravens facing a quick turnaround for Thursday's showdown with the Bengals, Dixon may not have sufficient time to make a full recovery from the knee injury he sustained in Baltimore's 47-3 win over Buffalo in Week 1. Dixon logged 44 yards and a touchdown on 13 carries in that contest, but he's likely to handle fewer snaps behind Alex Collins and Javorius Allen in more competitive games. Dixon (knee) didn't practice Monday, freelance NFL writer Jeff Zrebiec reports. Dixon is dealing with a knee injury and is expected to miss an undetermined amount of time, Jeff Zrebiec of The Athletic reports. Dixon ran for 44 yards and a touchdown on 13 carries during Sunday's 47-3 win over Buffalo. Analysis: Dixon put the finishing touches on Sunday's beatdown with a two-yard touchdown run in the fourth quarter. He finished as the team leader in carries and rushing yards, despite playing behind Alex Collins and Javorius Allen during the first half. Dixon would be unlikely to get so many touches in a more competitive contest. That, and a potential late-game injury, will be worth watching in the coming days. The Ravens will face the Bengals on Thursday. Dixon (unspecified injury) limped off the field with trainers late in Sunday's game against the Bills, Jamison Hensley of ESPN.com reports . 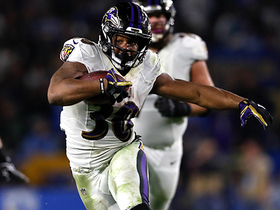 Analysis: Prior to his exit from the contest, Dixon had carried 13 times for 44 yards and a TD in a game in which the Ravens utterly dominated the Bills. Alex Collins and Javorius Allen thus currently profile as the team's top healthy backs. 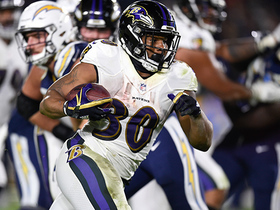 Dixon rushed five times for two yards and brought in all three of his targets for 18 yards in the Ravens' 27-10 preseason win over the Dolphins on Saturday. Analysis: Dixon clearly couldn't get anything going on the ground, but he showed off his pass-catching acumen while drawing the start. The 24-year-old seems like he has a firm hold on the No. 3 running back job behind Alex Collins and Javorius Allen, a role that could give him some utility in deeper PPR formats to open the season. Dixon (undisclosed) returned to practice Thursday after missing Wednesday's session, Jamison Hensley of ESPN.com reports. Analysis: That said, the report suggests Dixon does not appear to be moving around at full strength. It's unclear if the running back had a minor setback, of if he is still shaking off the rust following an injury-marred 2017 campaign. 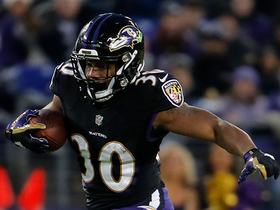 Generally speaking, however, coach John Harbaugh has been pleased with what he's seen from Dixon this summer, but for the time being Alex Collins and Javorius Allen remains ahead of Dixon in Baltimore's backfield pecking order. Dixon rushed six times for 32 yards and caught three of his four targets for 24 receiving yards in Monday night's 20-19 win over the Colts in the third preseason game. Analysis: Dixon showed some juice, making chunk plays both on the ground and in the air. He entered Monday's contest after Buck Allen, who finished with three carries for 19 yards and two catches for 11 more. With projected starter Alex Collins not playing, both Dixon and Allen acquitted themselves nicely, with Dixon's 56 scrimmage yards leading the Ravens. Dixon (undisclosed) is set to make his preseason debut Monday against the Colts, Ryan Mink of the Ravens' official site reports. "He looked good in practice the past few days, [he] looks like he's healthy, so to see him in a game will be exciting," coach John Harbaugh said. Analysis: Things are trending in the right direction for Dixon after sitting out of the first two preseason games with nagging injuries. However, there is some pressure on Dixon with Alex Collins established as the starter and Javorious Allen seemingly locked into the No. 2 role. Dixon figures to get a fair bit of run in Monday's game, which makes him a target in daily contests as the team continues to evaluate where he fits in its running back pecking order. Dixon (undisclosed) is not playing in Thursday's game against the Rams, freelance NFL writer Jeff Zrebiec reports. Analysis: After taking the field in full uniform during pre-game warmups, Dixon was no longer suited up when it was time for the opening kickoff. He missed more than a week of practice with a hamstring issue earlier in training camp and was removed from Tuesday's session with an undisclosed injury. Dixon's continued absence makes Javorius Allen a clear favorite for the No. 2 spot on the depth chart. 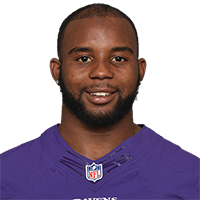 Dixon (undisclosed) is in uniform for Thursday's preseason game versus the Rams, Kyle J. Andrews of 105.7 The Fan Baltimore reports. Analysis: During warmups, Dixon was seen running routes, which comes on the heels of a hamstring injury that held him out for the majority of training camp to date. If he plays, he could earn a sizable workload with starter Alex Collins likely contained to minimal work in the exhibition opener. Dixon was removed from Tuesday's practice early, Jamison Hensley of ESPN.com reports. Analysis: Dixon returned from a hamstring injury Saturday and made it through three practices without incident, but it appears he suffered a setback or a new injury. Coming off a season lost to a torn meniscus, the 2016 fourth-round draft pick hasn't logged enough time on the practice field to make his case for a role in the Baltimore offense. Javorius Allen may end up unchallenged in the No. 2 running back spot. 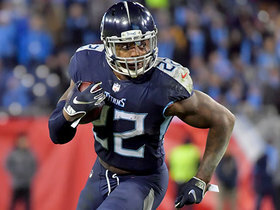 Dixon (hamstring) returned to practice Saturday, Jamison Hensley of ESPN.com reports. Analysis: Dixon had missed just over a week of training camp after tweaking his hamstring in late July, an untimely obstacle in his bid for a change-of-pace role behind likely starter Alex Collins. Dixon missed the entirety of his 2017 campaign due to a torn meniscus, so a swift return to full health will be key for his overall prospects. Dixon (hamstring) didn't practice Monday, Jamison Hensley of ESPN.com reports. Analysis: Dixon has missed three consecutive practices after injuring his hamstring Thursday, and while there's been nothing to indicate it's a serious issue, any missed time is problematic for a player looking to rebound from a lost season. He missed all of 2017 due to a torn meniscus and is now hoping to push Javorius Allen for the right to serve as a change-of-pace complement to lead runner Alex Collins. It isn't out of the question for Baltimore to find roles for all three backs. Dixon (hamstring) isn't practicing Friday, Jeff Zrebiec of The Athletic reports. Analysis: Dixon left Thursday's practice after tweaking his hamstring, and while the injury isn't believed to be serious, it will keep him off the field for at least one day. After missing all of last season with a torn meniscus, the 2016 fourth-round pick figures to compete with Javorius Allen for the No. 2 spot on the depth chart behind incumbent starter Alex Collins. Dixon's early exit from practice Thursday was attributed to a tweaked hamstring, Jeff Zrebiec of the Atlantic reports. Analysis: That Dixon's injury appears to be a minor one and unrelated to previous knee issues is good news for the 24-year-old, who last suited up for a game in 2016. 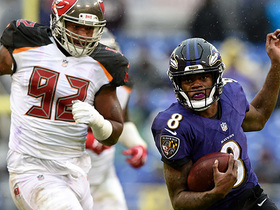 For now, Dixon slots in as the Ravens' No. 3 running back behind Alex Collins and Javorius Allen, but if healthy, the 2016 fourth-rounder figures to push Allen for the No. 2 slot, as well as potentially eat into Collins' workload as the 2018 campaign progresses. Dixon departed Thursday's practice due to an undisclosed issue, Jamison Hensley of ESPN.com reports. Analysis: Dixon headed to the locker room about 40 minutes into the session with a trainer by his side. The Ravens should soon provide clarification on what prompted his early exit, but a setback of any length of time won't help Dixon's case for opening the season with any sort of meaningful role in the team's rushing attack. Dixon slots in as the Ravens' No. 3 running back behind Alex Collins and Javorius Allen, Sarah Ellison of the team's official site reports. Dixon may push Javorius Allen for the No. 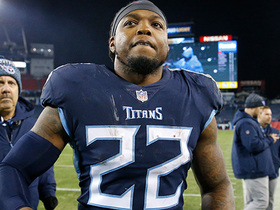 2 spot on the depth chart, NFL.com's Michael Fabiano reports. Coach Jim Harbaugh mentioned Dixon as a player who has "started to really jump" during practice the last week, the Ravens' official site reports. Dixon indicated after Monday's practice that his knee "feels totally well" and he is ready to play, the Ravens' official site reports. 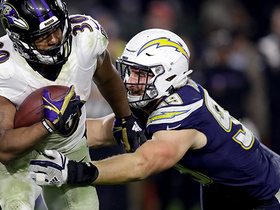 Ravens coach John Harbaugh mentioned Dixon (knee), Alex Collins and Javorius Allen when discussing the team's backfield for 2018, Jeff Zrebiec of The Baltimore Sun reports. "I think we have a whole good group of guys," Harbaugh said. "Obviously, we have a starter and Alex has proven that. He had a great year last year. He makes people miss. He breaks tackles, gets yards after contact. This is a player that makes stuff happen. He's exciting. I know our fans love him. And we're going to get Kenneth Dixon back. I think Buck Allen had his best year by far last year. He's kind of growing, coming into his own as a football player. Those are three really good backs." Dixon (knee) will be ready when the Ravens begin OTAs, Jeff Zrebiec of The Baltimore Sun reports. Baltimore Ravens running back Kenneth Dixon runs through the hole for 19 yards. 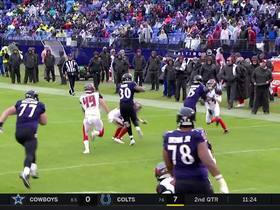 Baltimore Ravens running back Kenneth Dixon refuses to go down on an 11-yard catch. 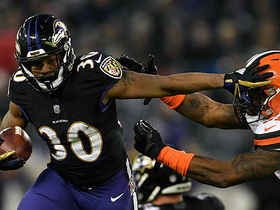 Baltimore Ravens running back Kenneth Dixon delivers stiff arm to extend run for 16 yards.